At the end of each year, it is a useful practise to review the triumphs (and failures) of the past 12 months. It is an exercise of putting everything into perspective. 2017 has been an incredible year for Parkinson’s research. And while I appreciate that statements like that will not bring much comfort to those living with the condition, it is still important to consider and appreciate what has been achieved over the last 12 months. As everyone in the Parkinson’s community is aware, in 2017 we were observing the 200th anniversary of the first description of the condition by James Parkinson (1817). But what a lot of people fail to appreciate is how little research was actually done on the condition during the first 180 years of that period. 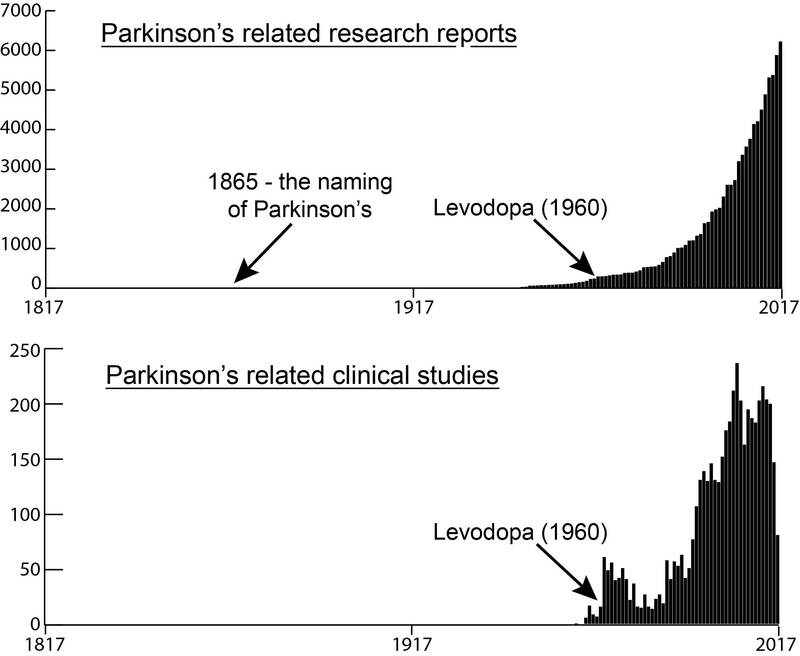 The graphs above highlight the number of Parkinson’s-related research reports published (top graph) and the number of clinical study reports published (bottom graph) during each of the last 200 years (according to the online research search engine Pubmed – as determined by searching for the term “Parkinson’s“). PLEASE NOTE, however, that of the approximately 97,000 “Parkinson’s“-related research reports published during the last 200 years, just under 74,000 of them have been published in the last 20 years. That means that 3/4 of all the published research on Parkinson’s has been conducted in just the last 2 decades. And a huge chunk of that (almost 10% – 7321 publications) has been done in 2017 only. Multiple System Atrophy: A prion disease? ‘Parkinsonisms’ refer to a group of neurological conditions that cause movement features similar to those observed in Parkinson’s disease. They include multiple system atrophy (MSA) and Progressive supranuclear palsy (PSP) and idiopathic Parkinson’s. Newly published research now shines a light on a possible mechanism for differentiating between multiple system atrophy and idiopathic Parkinson’s. In today’s post we will look at what multiple system atrophy is, review the new research report, and discuss what these results could mean for the Parkinson’s community. For a long time I have been looking to write a piece of Multiple system atrophy. I have been contacted by several readers asking for more information about it, and the only thing really delaying me – other than the tsunami of Parkinson’s related research that I am currently trying to write posts for – was the lack of a really interesting piece of research to base the post around. Title: Familial Parkinson’s point mutation abolishes multiple system atrophy prion replication. Authors: Woerman AL, Kazmi SA, Patel S, Aoyagi A, Oehler A, Widjaja K, Mordes DA, Olson SH, Prusiner SB. Journal: Proc Natl Acad Sci U S A. 2017 Dec 26. pii: 201719369. This is a really interesting piece of research, that continues a line of other really interesting research. And if it is independently replicated and verified, it will have massive implications for the Parkinson’s community, particularly those affected by Multiple System Atrophy. What is Multiple System Atrophy? In the 1990, scientists identified some fruits that they suspected could give people Parkinson’s. These fruit are bad, they reported. More recently, researchers have identified chemicals in that exist in those same fruits that could potential be used to treat Parkinson’s. These fruit are good, they announce. In today’s post, we will explain why you should avoid eating certain members of the Annonaceae plant family and we will also look at the stream of research those plants have given rise to which could provide a novel therapy for Parkinson’s. In the late 1990s, researchers noticed something really odd in the French West Indies. It had a very strange distribution of Parkinsonisms. ‘Parkinsonisms’ refer to a group of neurological conditions that cause movement features similar to those observed in Parkinson’s disease, such as tremors, slow movement and stiffness. The name ‘Parkinsonisms’ is often used as an umbrella term that covers Parkinson’s disease and all of the other ‘Parkinsonisms’. 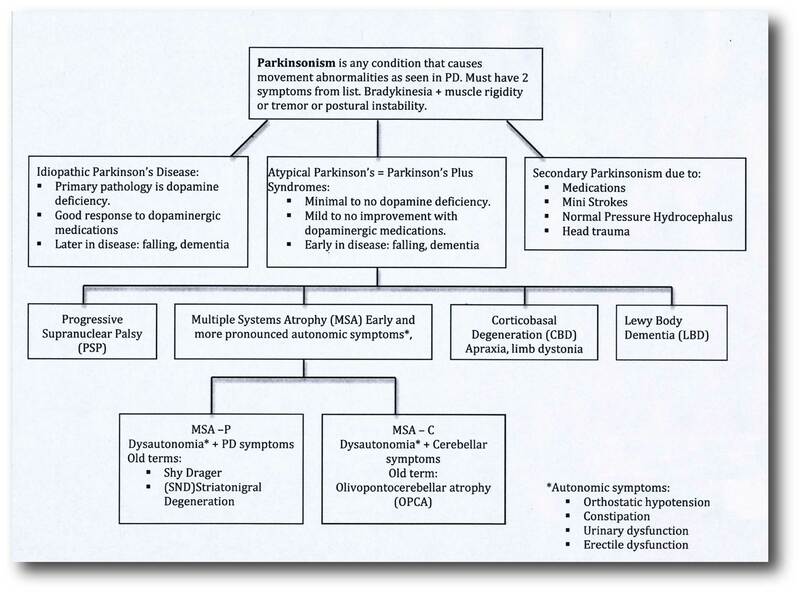 Some forms of Parkinsonisms that at associated with genetic risk factors, such as juvenile onset Parkinson’s, are considered atypical. But as our understanding of the genetics risk factors increases, we may find that an increasing number of idiopathic Parkinson’s cases have an underlying genetic component (especially where there is a long family history of the condition) which could alter the structure of our list of Parkinsonisms. So what was happening in the French West Indies? Here at the SoPD we are politically neutral. That said, I will report on events that directly impact the world of Parkinson’s disease research (without adding too much in the way of personal opinions). Recent legislation introduced in the US congress could have major implications for subsets of the Parkinson’s disease community, as well as a host of additional medical conditions. The legislation is seeking to remove the orphan drug tax credit. In today’s post, we will have a look at what the orphan drug tax credit is, and why its removal could be damaging for Parkinson’s. On November 2, House Republican lawmakers introduced a bill to reform the U.S. tax code. The complicated tax system probably needs a serious clean up, but the legislation will also terminate something called the orphan drug tax credit. 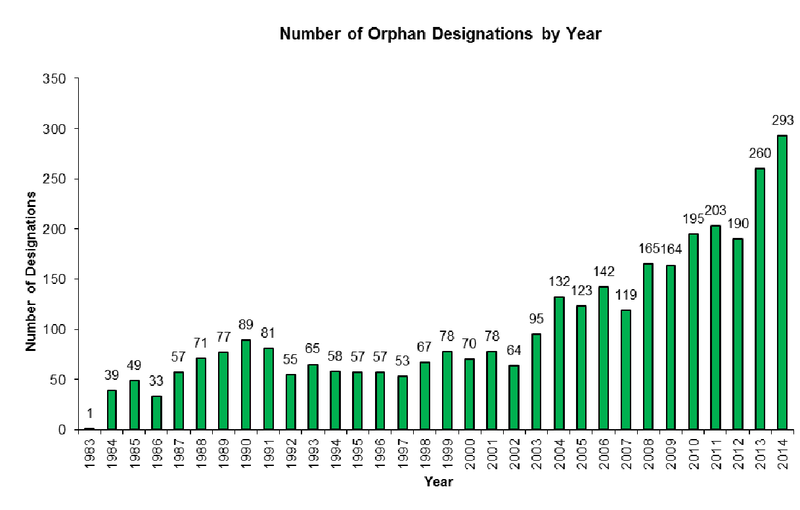 What is the orphan drug tax credit? The autoimmunity of Parkinson’s disease? In this post we discuss several recently published research reports suggesting that Parkinson’s disease may be an autoimmune condition. “Autoimmunity” occurs when the defence system of the body starts attacks the body itself. This new research does not explain what causes of Parkinson’s disease, but it could explain why certain brain cells are being lost in some people with Parkinson’s disease. And such information could point us towards novel therapeutic strategies. The journal Nature was first published on 4th November 1869, by Alexander MacMillan. It hoped to “provide cultivated readers with an accessible forum for reading about advances in scientific knowledge.” It has subsequently become one of the most prestigious scientific journals in the world, with an online readership of approximately 3 million unique readers per month (almost as much as we have here at the SoPD). Each Wednesday afternoon, researchers around the world await the weekly outpouring of new research from Nature. And this week a research report was published in Nature that could be big for the world of Parkinson’s disease. Really big! Journal: Nature. 2017 Jun 21. doi: 10.1038/nature22815. In their study, the investigators collected blood samples from 67 people with Parkinson’s disease and from 36 healthy patients (which were used as control samples). They then exposed the blood samples to fragments of proteins found in brain cells, including fragments of alpha synuclein – this is the protein that is so closely associated with Parkinson’s disease (it makes regular appearances on this blog). What happened next was rather startling: the blood from the Parkinson’s patients had a strong reaction to two specific fragments of alpha synuclein, while the blood from the control subjects hardly reacted at all to these fragments. In the image below, you will see the fragments listed along the bottom of the graph (protein fragments are labelled with combinations of alphabetical letters). The grey band on the plot indicates the two fragments that elicited a strong reaction from the blood cells – note the number of black dots (indicating PD samples) within the band, compared to the number of white dots (control samples). The numbers on the left side of the graph indicate the number of reacting cells per 100,000 blood cells. The investigators concluded from this experiment that these alpha synuclein fragments may be acting as antigenic epitopes, which would drive immune responses in people with Parkinson’s disease and they decided to investigate this further.